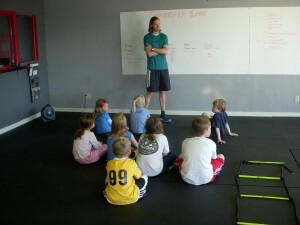 CrossFit Kids Lake Highlands | What is CrossFit Kids? CrossFit Kids is not simply a scaled down version of CrossFit, it is CrossFit geared and designed for children and the specific developmental needs of children (neurological, cognitive, motor). CrossFit Kids is the principal strength and conditioning program for many young athletes and the primary P.E. program for many home schools and charter schools. It is used by athletic teams, martial arts schools and many parents that want their kids to grow up healthy, strong and have a life long love of exercise, thus avoiding the common problems associated with childhood inactivity and obesity. Our program delivers a fitness that is, by design, broad, general, and inclusive. Our specialty is not specializing. Healthy living requires that our kids push, pull, run, throw, climb, lift and jump effectively and safely regardless of whether or not they participate in organized athletics. Athletics is a specialized pursuit. Our goal is to support the specialist, but reward the generalist. GAME! – the entire class is focused around that game. If time runs short, everything above is cut back so that we can get to the game! The kids love the games. In addition the children will learn about nutrition, in a fun way, and practice math skills appropriate for their age. Right now we are offering the kids class for children 5-12 years old. If demand is high enough we may add a teen class and a pre-school class. Classes are approximately 30-45 minutes long.